Your fleet relies on hydraulic cylinders and related components every day. Even the highest quality Cat® equipment can require periodic repairs or maintenance, particularly when you use them in harsh operating conditions. 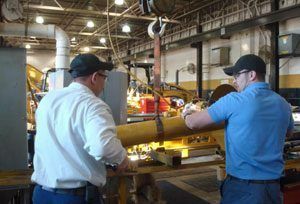 As a partner of the government and defense industries since 1951, Gregory Poole can help you with any hydraulic cylinder repair issue. For more information about your hydraulic repair options or to request a quote, contact the Gregory Poole service department. Exceptional quality control — We bench and leak test all cylinders as necessary. Fast turnaround times — We run two shifts of technicians a day and have an extensive selection of available parts. Expert advice — We follow Caterpillar® guidelines to help you make informed repair vs. replace decisions. Can’t make it to our machine shop? We can perform many hydraulic repair services in the field. With a fleet of fully equipped mobile service trucks, we can typically dispatch a technician to your location in 24 hours or less. Don’t wait to repair or perform routine maintenance on your important hydraulic components. Call Gregory Poole to book an appointment today.